After many weekends away, or here with work, I finally got a two day stretch in which to play. 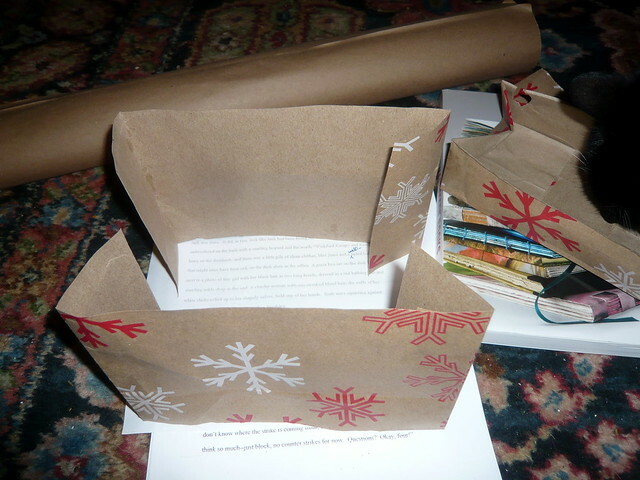 No one was able to use the kitchen table for a whole weekend because I had it strewn with carving tools and materials, bits of paper, paper cutters . . . it was great. 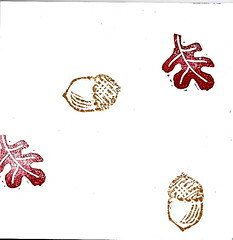 I turned out about 40 handmade note pads featuring my hand-carved stamps. 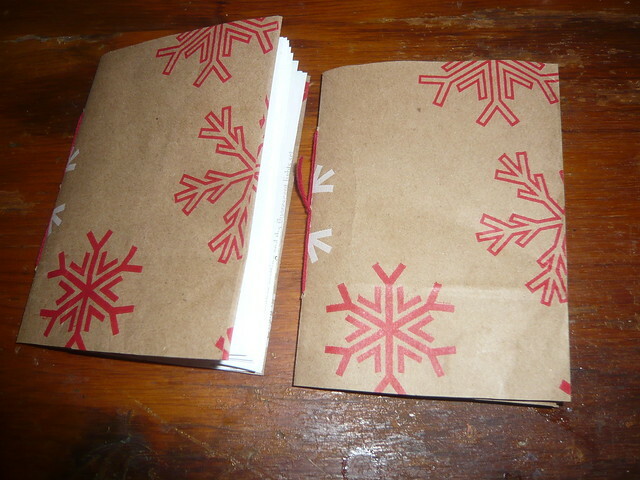 On Monday when I stopped into the copy store to buy more sheets of cardboard for the notebook backs, I found in the shorts bin (from which the shop sells stacks of cut paper that would otherwise go to waste) a lot of appealing paper stacks and a dozen stacks already made into nice blank white paper notebooks. Only then did it dawn on me that instead of printing my papers, assembling them in a cardboard backed stack and then binding them with padding compound (2 coats, with a rest to dry in between), I could probably simply have bought unstamped, already assembled note pads and just stamped on the pages. It would have cost a bit more, but would have been waaay quicker. So I might do that next time. 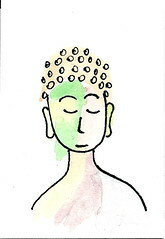 I’ve been getting together regularly with a few friends to do a little art-making. We’re all writers (though one of us–not me!–is also an accomplished artist) and it makes us feel better to dust off the right side of our respective brains together once a month. So I’ve been making craft aprons for us. Each one is different and I feel like each one has evolved a bit over the previous ones (to the point that I want to take back some of the earlier aprons and do them RIGHT). 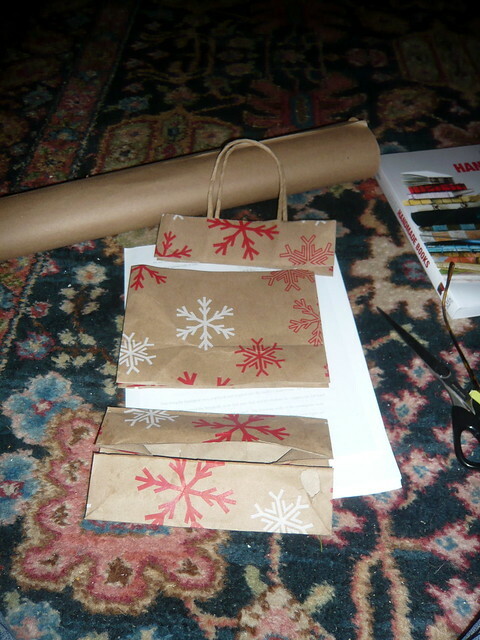 The first two have been rather short, like cafe aprons–I made them with paper crafts–not messy stuff–in mind. But we’ve got a painting day coming up, and I thought it was time to try a long apron. 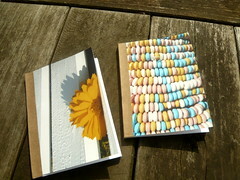 Et voila–it all came together today and I thought you might like to see what I did. 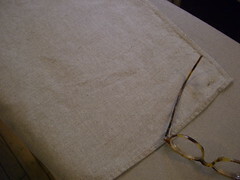 Best of all, it’s totally adaptable to the wearer and their craft and the tools of choice, so you’ll end up with an apron that has places for all your bookbinding tools, and you’ll make one that will hold all your paper schnipsels and so on and you will remember where you put your glasses. I must say that, like most aprons, it looks a little better when it’s actually on somebody. and the details (close-ups coming) are everything. And that already I can see little things I’ll do differently next time. But, overall? Very pleased. Want to make your own? 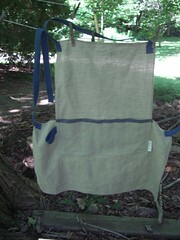 I made this crafter’s apron from two linen/cotton blend dish towels that were 50 cents each at the local odd lots store. My towels were 26-1/2″ by 15-1/2″–your results may vary depending on the size of your towels, but you can mad adaptations as needed–they do need to be rectangular, though. You can also substitute fabric of your choice, but it will need to be hemmed (take this into account when you measure your yardage). 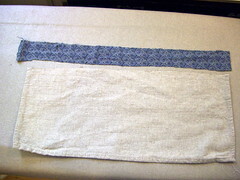 NOTE: throughout this tutorial, the right side of the towel (check the hem if you’re not sure which is the right side) is the right side of the finished apron. 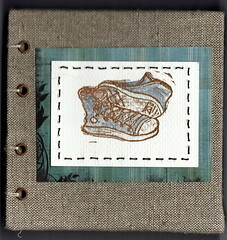 a sewing machine, pins, a measuring tape, and scissors. NOTE: this is a good sturdy apron but it won’t protect you from anything more than you’d expect a dish towel to do–no very wet stuff, nothing radioactive, no alien body fluids. If you work with a lot of liquid-y paint, you might want something denser than this. That said, the linen is nice–tight weave and not so absorbent that it simply transfers the mess to the other side of the apron–and your favorite shirt. 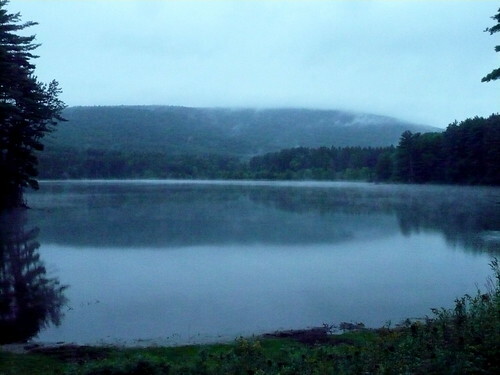 All three pieces are right side up–facing us (check the hemmed edges of each piece). Got that? 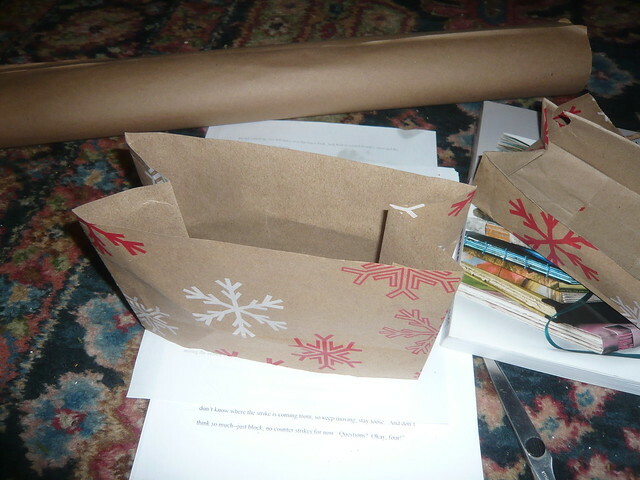 Okay, the hard part is done–now it’s assembly time. First (and there’s no photo for this one, so you’re going to have to trust me–remove the pocket piece and set it aside, but don’t move the apron front on which it lay. 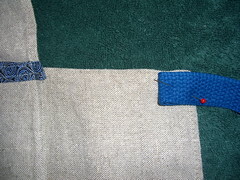 In fact, pin that to the apron skirt (the underneath, uncut, horizontal piece) and machine stitch them together so they maintain their positions. 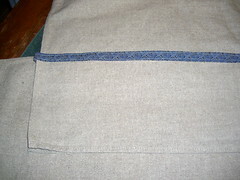 This seam isn’t going to show but it’s structurally important–sew them together close to the top edge of the apron skirt. 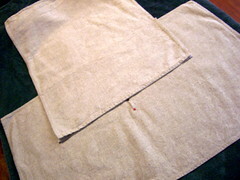 Now leave the apron body for a few minutes and get the pocket piece. Lay it right side up on a smooth surface and get ready to unite it with the contrasting edge strip. 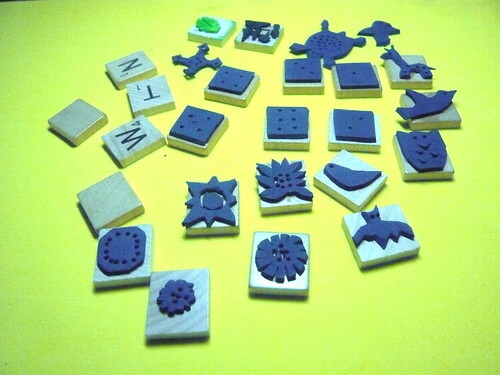 Here are my pieces, laying on top of my ironing board (I have really got to get a different color ironing board cover). See the bottom edge and sides of the pocket piece–all nicely hemmed? Good. The top edge of the pocket piece is the part you cut off right at the beginning, and that cut edge is going to be finished with the contrasting strip. Take the contrasting strip and flip it so the wrong side is up. Arrange it over the very top of the pocket piece. 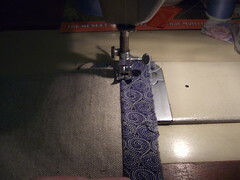 See–two fabrics right sides together getting ready to be sewn together just like in a normal project. Make sure the contrast strip sticks out about an inch on either side of the pocket piece–this will make it look nicer soon. 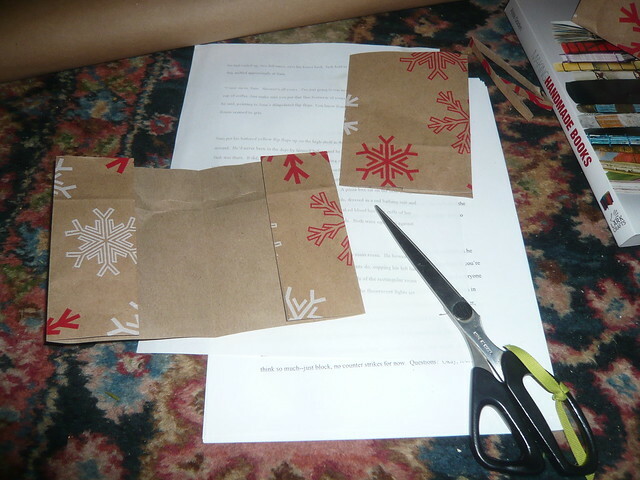 Pin ’em if you’ve got ’em, but I managed just to hold them together with my fingers as I sewed them together. 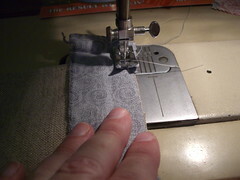 I know, I know–my picture shows me sewing this strip much closer to the edge. One of the things I decided after the project was finished is that a wider contrast edge would look nicer, so I’m telling you to stitch yours rather further from the edge–just do it. Ahh, the power! The power! BWAAHAAAHAAHAAA . 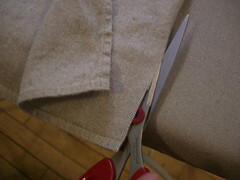 . .
Now fold the top edge of the contrast strip behind the top edge of the pocket piece. 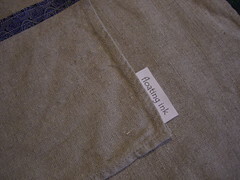 Don’t fold the pocket fabric along with it, just encourage the contrast strip to cover it neatly. Remember that this part you just tucked away won’t show, so don’t worry about the rough edge you’re folding back, but do try to fold back the sticky-outy pieces jutting out at the ends of the strip–finesse these so thee ends look pretty and neat, then topstitch again, this time quite close to the top edge of the contrast strip-covered pocket piece. See how I’ve laid it back where it was before, on top of the apron front? Now we’re going to bring it all together. 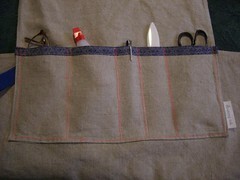 Make sure the pocket piece is lined up so it lays on top of and corresponds with the bottom of the apron front piece. 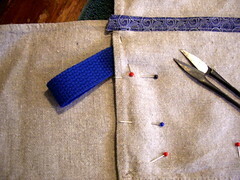 This time I do recommend pinning–use pins to stabilize the whole thing–you’re going to be sewing through all three layers along the sides and bottom edge of the pocket piece. Think as you go about how you’d like to customize your own apron. Can you add a hook for keys or a tool you use a lot? An elastic loop for a wiping rag? A special pouch for the different cutters that come with your screw punch? It’s your apron, so make it so that it will be useful to you. I’m thinking a little Fray-Check on the tie ends would be a good thing–will have to get some next time I’m out. But for $6 (look for those 50 cent towels–or, even better, look in Goodwill or thrift stores or your grandma’s cupboard for some) and an hour’s work, I’ve got . . . the craft apron of my dreams. At least, until I figure out how I could have made it better. After doing some watercolor thank you notes for some friends who helped us out of a jam recently, I started looking at the little dribs and drabs (though most of them weren’t drab at all) left in the palette sections of my paint box. 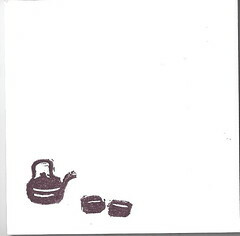 There were several very small pieces of paper on the table–ATC-sized mini Bristol board (would it surprise you to know that we very rarely actually eat at the table because it’s always buried under art supplies and books? 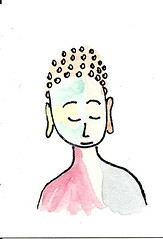 ), so I started piddling with how the little daubs of color would look together. 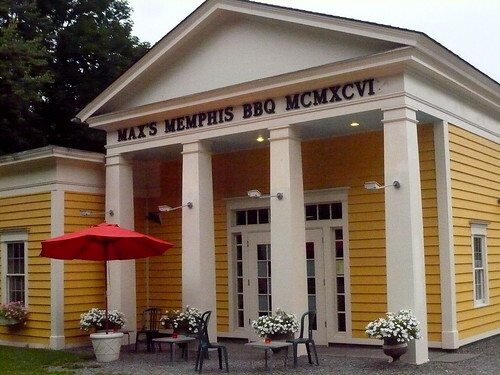 Never wash out your palette–you never know when you might need those colors! Of course, the reason I haven’t finished the long project I’m working on for my sister’s birthday is that I’ve hardly been around. Four weekend trips in four consecutive weekends have left me playing catch-up. 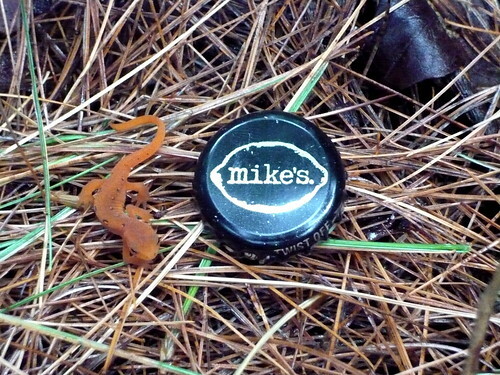 Note: the Mike’s cap is just here for scale–tiny red efts were everywhere–but it was handy. 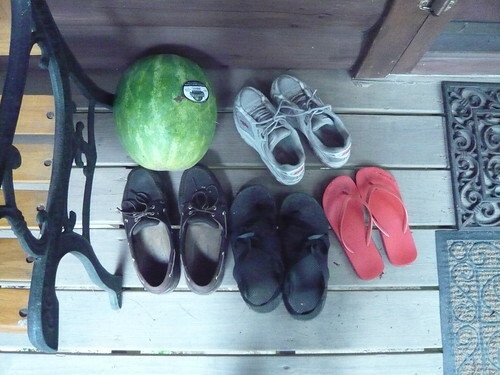 It was that kind of weekend. But I’m back, back at work on the many parts of this project. 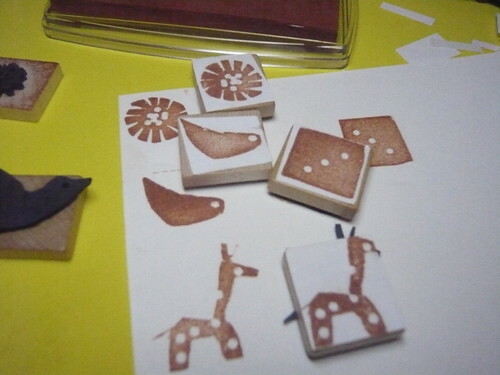 One of them warranted making some new hand-cut stamps, and those, in turn, seemed to warrant a little tutorial. So here goes. 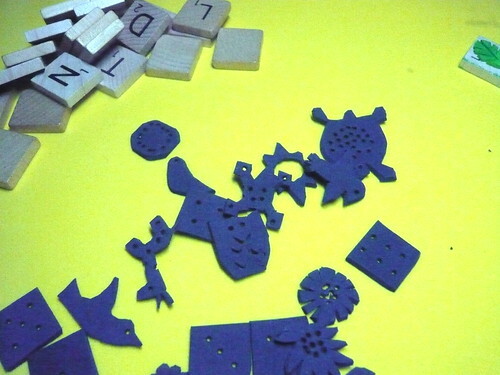 Glue the foam pieces to the blank sides of the Scrabble tiles (it doesn’t really matter much which side you glue them on, but this way the letters on them won’t show in the finished stamp. Use the toothpick to clear away any excess glue, taking care to make sure any holes in the designs aren’t filled up with glue. Let dry for about 30 minutes. 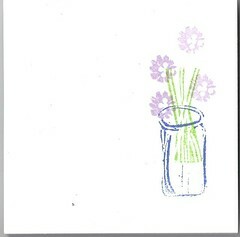 Using the stamp ink, stamp each design onto the sheet of mailing labels. Leave enough room between each one that you can cut around it and have it fit on the back of the tile. Then cut out each design, centering it in the middle of a tile-sized square (and orienting the label to correspond to the placement of the foam shape on the other side, and you’re done.